Students looking for more variety in their campus meals can now look to the Oak Café, located between the theater and arts/science buildings. It opened this Wednesday. David Williams, an engineering major, was looking forward to the Oak Café opening day. Kristen Rankin, a second semester student in the culinary program, spoke highly of the Oak Café. Sandwiches are made fresh daily, and the breads are baked from scratch; the sausages used in their “pigs in a blanket” are cased in house. They also serve soup on colder days, and for those with a sweet-tooth, there are a variety of brownies, cookies, cakes, and other desserts to choose from. The food is available on a first come first serve basis. For those looking for a dine in experience, The Oak Café Restaurant serves a three course meal for $17, giving customers a chance to try foods of all different cultures and culinary techniques. The lunch provides a first course, main entree, and a dessert, with each course having multiple options. The restaurant posts its monthly menu online, showcasing the different cuisines offered for the week. One entree for this week’s Cuban inspired menu is pollo agridulce–quick fried chicken thighs flavored with mango, ginger, cumin, chili, and cilantro. Dr. Brian Knirk has been the department chair of the culinary arts and hospitality management since 1999. He shared where former Oak Café students are working currently. 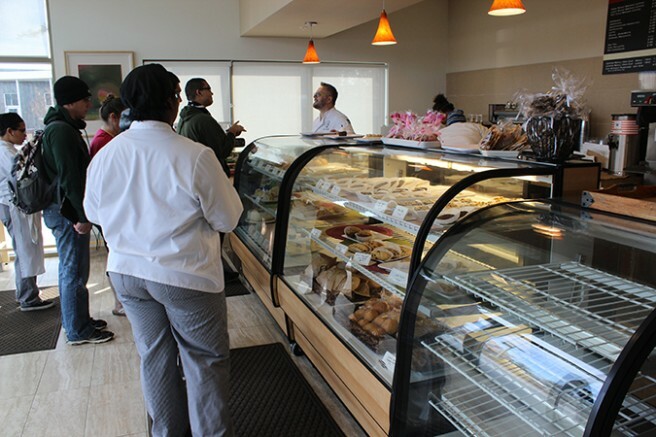 The Oak Café Bakery is open Wednesday through Friday from 8 a.m. to 2:30 p.m. The Oak Café Restaurant is also open Wednesday through Friday, but serves lunch from 11:30 a.m. to 1:30 p.m.
1 Comment on "ARC’s Oak Café opens for spring 2016"
The carrot cake muffin here made we weep tears of joy.